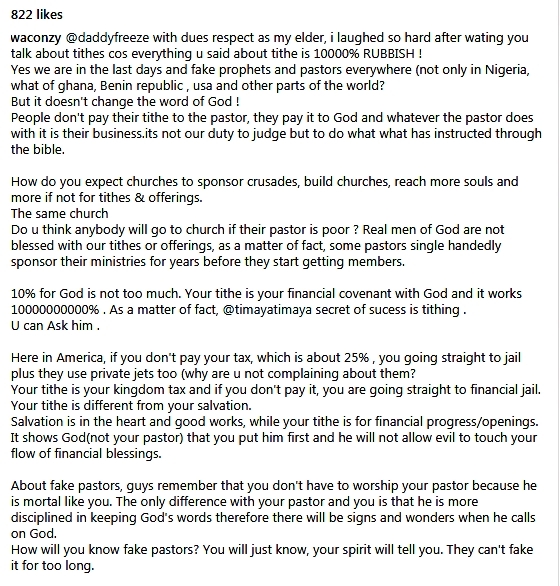 Port Harcourt born singer, Obinna Kelvin Anyanwu, also known as Waconzy, took to his Instagram page earlier today to slam popular Lagos OAP, Daddy Freeze’s who has been in constant teachings on not paying of tithes to pastors in the church. According to Waconzy, all the preachings of the controversial Cool FM OAP is absolute rubbish as tithe belong to God and not the pastors. 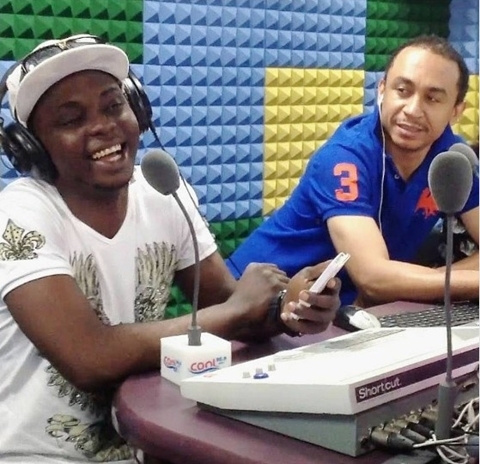 “@daddyfreeze with dues respect as my elder, i laughed so hard after wating you talk about tithes cos everything u said about tithe is 10000% RUBBISH! How do you expect churches to sponsor crusades, build churches, reach more souls and more if not for tithes & offerings. The same church. 10% for God is not too much. Your tithe is your financial covenant with God and it works 10000000000% . As a matter of fact, @timayatimaya secret of sucess is tithing . U can Ask him . Your tithe is your kingdom tax and if you don’t pay it, you are going straight to financial jail. Your tithe is different from your salvation. It shows God (not your pastor) that you put him first and he will not allow evil to touch your flow of financial blessings. Thanks for the correction. Your brain will not freeze. Anyone, irrespective of his or her exalted position in the society, even some preachers as well. Whoever condemns the Scriptural command or instruction to pay Tithes and Give even Sacrificially, DOES NOT REALLY KNOW GOD AND HIS WAYS. Let me add this, it’ll shock you: FAILURE TO PAY TITHES AND GIVE SACRIFICIALLY, WILL NOT ONLY BLOCK YOUR BLESSINGS AND OPEN DOORS FOR GE DEVOURERS TO INVADE YOUR FINANCIAL LIFE; “IT CAN PREVENT YOU FROM MAKING HEAVEN.” Believe it or not, IT DOES NOT CHANGE THE TRUTH. When people lack personal encounter with God, they can criticism anything, condemn anything, stand against the Ways of God and glory in ignorance, playing the fool to their own detriment. For more revelational knowledge, pls, click on my Facebook Name: Victor Sampson. God bless you.